It's Alison/Craftytrog here, starting the year off with a totally non-seasonal January challenge for you! Lol! 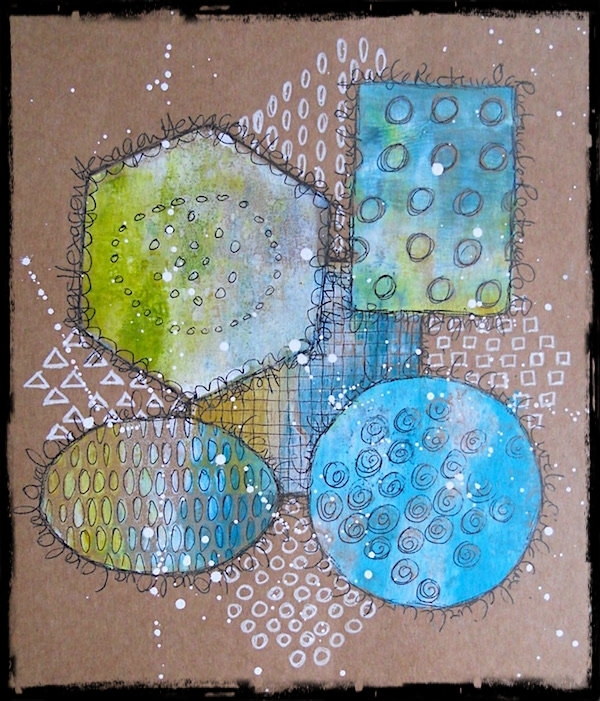 My Challenge Theme is 'Geometric Shapes'. Gel Press Plates in different shapes, to print with, and also added some marks of matching shapes. You could draw/paint geometric shapes, cut shapes out, use square, oblong, pyramid, and round teabags, the list is endless! I'm so happy to be back hosting this great challenge, and I hope you'll have fun with my theme and please don't forget to adhere to our few rules. A super new theme Alison and a fantastic inspiration page. I agree Yvonne. I look forward to seeing what you come up with this month. A different type of theme this time, Alison, and one which I will enjoy, thanks. I love these blues and browns in your super inspiration piece. I was thrilled to see you had posted your first entry already. Looks like you are starting strong, too. Dear Alison your start up for the New Year looks wonderful,great textures. This theme gives us a lot of Physiologie to create our own pages, thank you. I also look forward to seeing what you come up with this month, Sabine. So glad you are inspired by Alison's theme. I am glad that the blog still exists. I thought it was closed last year and found it by looking into my old link lists. I like the theme and made a new journal page after some time. 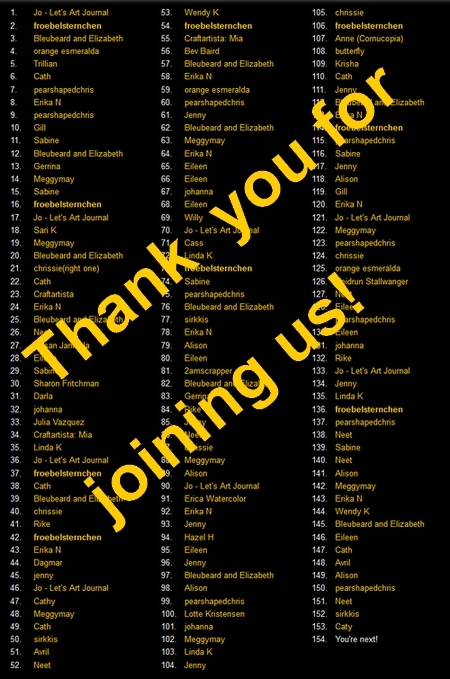 We are delighted you found us again, Trillian, and hope you won't be a stranger, now that you know we are still here and creating journal pages. Great theme Alison - love the page you craeted. Good to see you here again, Gill. Don't those shapes look a picture upon that Kraft page. Fabulous Start of the year prompt. Happy New Year to all at **Art Journal Journey** May 2019 be full of inspiration. Thank you dear Tracey - always a pleasure to read you and to see your fantastic art at the collections! Thank you and the same to you, Tracey. We are delighted these shapes inspire you and hope to see your beautiful art here, too. Happy and Crafty new year 2019 for everybody! Thank you for this nice and inspirating challenge! Happy new year to you, too, Sari. I am delighted you are inspired by this theme and are delighted you joined us this month. Happy New Year to you, too, Chrissie. So glad to see you here this year. Happy New Year to all and thanks especially to Alison Craftytrog for a great theme which got me back in my craftroom. Oh Neet, we are so glad you were inspired by Alison's theme. And it is WONDERFUL to see you here again at AJJ. What an interesting collection of work for the challenge. Thank you for the inspiration - I was able to finish a work that had been sitting in the corner for ever so long. We are also delighted to see YOU here, too, Darla. We love your beautiful paintings and so glad you were able to finish one to share with us. Wonderful challenge and thanks to the DT for the inspiration! So glad you joined us, and you have created a beautiful first entry in 2019, too. what a great theme and inspiration page Alison! We are delighted Alison's entry inspired you Linda. We are so glad you joined us this month, Rike. So glad you like Alison's theme. Thank you very much dear Sirkka! How nice to read that Alison's theme inspired you, Sirkkis. A great theme Alison, had fun with this. So glad you enjoyed Alison's theme. You make great art and I always like to see your name when you share your journal pages with us. I'm having fun with this theme, Alison. Thank you for the inspiration. Yes, Eileen, I can see how much you like this theme and we are delighted you have chosen to share your art with us this month. Thank you everyone for all of your lovely comments and entries for my theme so far! I'm overwhelmed with all of the amazing art being shared! You certainly picked a winner, Alison! Fun theme and great page! I really wish I could leave you comments, 2amscrapper, but I'm not on G+ and would have to join in order to leave you a message. I really LOVE your art, too. Thanks for joining us this month. Wonderful spread and fabulous theme! Made it! I promised myself I'd try to play along at least once a month this year... and I didn't want to fall at the first hurdle. Great theme and I simply love those blues and greens over the kraft. Fab inspiration. I am so enjoying this challenge, thanks to Cath and Chris for putting me in touch with Art Journal Journey. This is a fantastique theme !! thanks so much. Love your so wonderful Art journal page Alison, really lovely.